Apartment Jazmin in Havana Vieja, a short walk to Plaza Vieja! 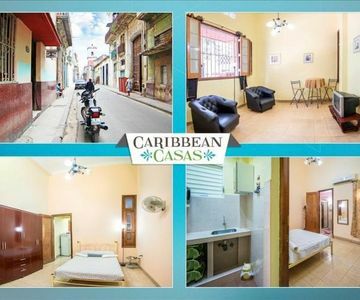 Settle in the centre of Havana in this one-bedroom apartment for two people, just a few steps from Plaza Vieja! Enjoy proximity to Havana´s best monuments, museums and attractions at the centrally located apartment, a perfect fit for two guests. The 60-square-meter apartment comprises one bedroom (with one double bed), one bathroom, a comfortable living room with sofas and a television, and a kitchen with basic amenities (microwave, cook top, coffeemaker). There is also a washing machine and dryer. The apartment is located 30km from the nearest beach, and other amenities are within walking distance, including a restaurant (300m) and a supermarket, bakery and other shops (all 150m).